Why put a sock over an outdoor faucet when you can trick it out with this puppy? Don't risk costly damage from burst pipes in your home, vacation cabin, RV or outbuildings. Screw Pipe Watchman onto the outdoor faucet and turn the water on. A small sensor in an internal microvalve recognizes a preset low temperature and allows a small amount of water to flow through the valve, preventing freezing. When the water reaches a preset warmer temperature, the valve closes. Made of high-impact polypropylene and enhanced resins with UV inhibitors. 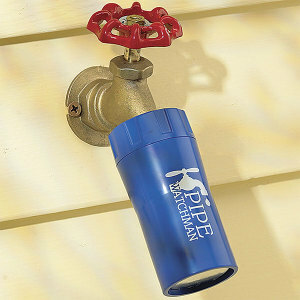 Protects pipes 24/7 without wasting water. Place one on every outside faucet. I have one of these units! They do not drip all winter! The unit only turns on for very short periods when the water in the pipe reaches 33 degrees F. As it runs it allows warmer water into the pipes. It works great! Agreed. Where we live (Catskill Mts., NY) it can be weeks between brief periods of above-freezing weather. Having water dripping for weeks and freezing immediately would result in... well, I'd rather not contemplate it. Soon, the ice would build up and enclose the whole faucet, which would shut down the dripping and... everything would freeze. Invented by someone living in Southern California. This (running clean water through the winter merely to keep a valve from freezing?) is not a smart idea. And it is certainly not environmentally friendly.